CHICAGO — Inspecting or auditing a self-service laundry for safety or security risks is common practice among the majority of store owners and operators polled in this month’s American Coin-Op Your Views survey. Roughly 44% of respondents audit their vended laundry store daily for safety or security risks, while another 31.7% say they do it weekly. Much smaller shares check their stores monthly (2.4%), quarterly (4.9%) or yearly (4.9%). 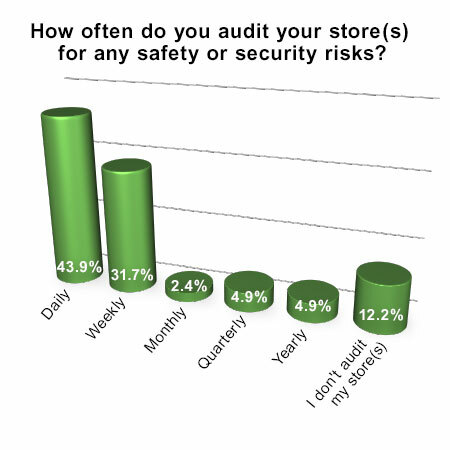 The remaining 12.2% of respondents say they “don’t audit [their] store(s)” for safety or security risks. Operators focus on any number of different areas when performing their checks, including equipment (82.9%), exterior areas such as the parking lot or sidewalks (82.9%), walking areas (80.5%), doors/locks (78.1%), furniture (48.8%) and “other” areas (9.8%). Having an attendant on site can help ensure a store remains safe, says a majority of respondents (85.4%). Roughly 7% say no to that notion, and the remaining 7.3% are unsure about an attendant’s impact on store safety. “Having an attendant on high-traffic hours is the most effective strategy to minimize accidents,” adds another. 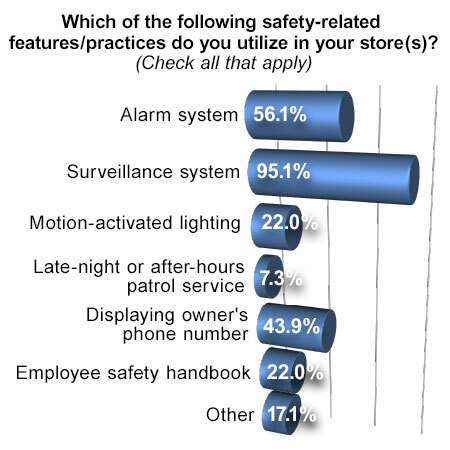 Surveillance systems is by far the most popular safety feature/practice used by the majority of owners and operators (95.1%) in their stores. Others include alarm systems (56.1%), “displaying [the store owner’s] phone number” (43.9%), motion-activated lighting (22.0%), an employee safety handbook (22.0%), and a late-night or after-hours patrol service (7.3%), according to the survey results. While American Coin-Op’s Your Views survey presents a snapshot of the trade audience’s viewpoints, its findings should not be considered scientific. Qualified subscribers to American Coin-Op e-mails are invited to participate anonymously in an industry survey. The entire American Coin-Op audience is encouraged to participate, as a greater number of responses will help to better define owner/operator opinions and industry trends.